Over the past few years of living on my own, I've put together a number of gallery walls both successfully and unsuccessfully. I've learned a few things along the way that I thought I'd share with you. 1.) Before you start hanging pieces, decide on a layout. I like to play with ideas by laying all my pictures on the floor and moving them around until I am satisfied with the look. 2.) Don't try to make things too perfect. That takes away from the entire gallery idea. I like to mix frame colors and purposely misalign the heights to give it an unexpected charm. Happy Friday! This weekend flew by for me. Are you excited it's almost Christmas? I hope you have a lovely weekend & get all your shopping done! Sam I love your gallery wall! It's so girly and perfect! Great for a bachelorette! love the estate lips!! your gallery wall is awesome....love the chairs too!! So feminine. Happy Weekend! It's perfect!! O my goodness. I love it! It's feminine. Absolutely gorgeous! 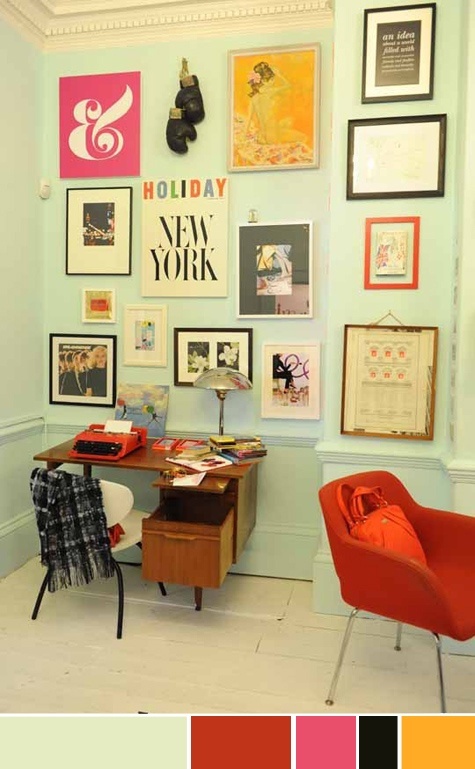 I have been collecting pieces for a gallery wall in my office and these are great tips!! So femme Sam! I love it! Nothing like a well curated gallery wall!! Yours is beautiful....Happy Holidays! seriously obsessed!! are those chairs custom upholstered?? because they're amazing. This is wonderful. The Marilyn Print in the middle is my favorite! Thanks for the inspiration! great tips! 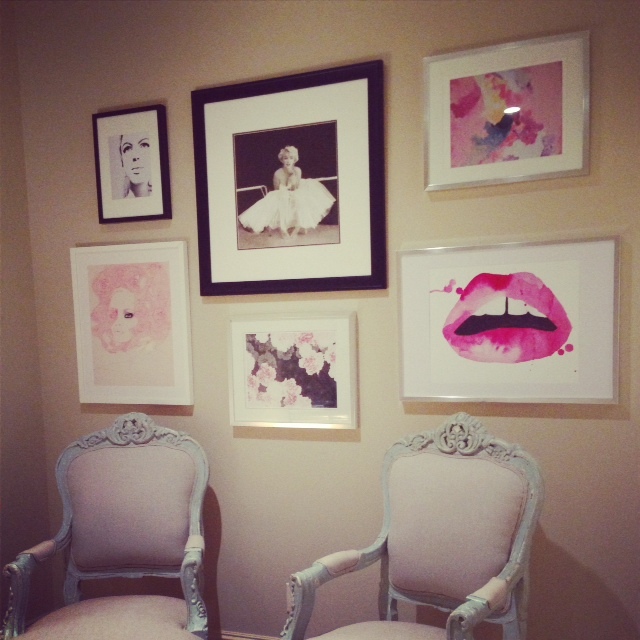 I love gallery walls - I try to install them in most of my client's homes! It looks awesome, Sam!! Love this combination and the touches of pink! And thank you for the tips - I'm in the process of creating my own gallery wall, these will come in so handy! well done, girly! love Nancy and Jessica's work. super talented ladies, and they make your wall look awesome! I love gallery walls. Yours looks great and I really like those chairs! Love a good gallery wall! These are awesome! Love your gallery and those chairs! Have a fantastic Christmas Sam, and thanks for your inspiration and blog friendship this year! Merry Christmas. Yes you are right - adding 3D texture does add interest, great tip! 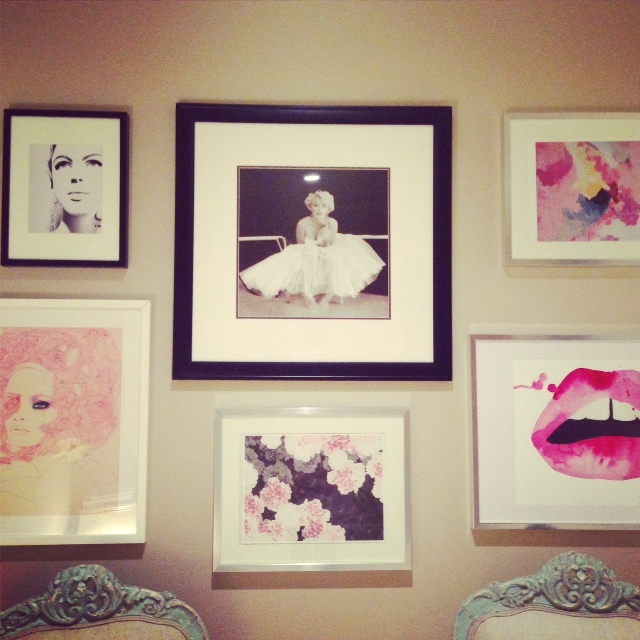 Is the gallery wall with Marilyn and the pick lips yours? It is beautiful. Very inspiring blog. Following on Bloglovin. love how your wall turned out - i really want to try something similar! Very fun and girly and well balanced.